As a child, I was forever being accused of living in a dream world. I hesitate to share this with many, as professionally I desire to be taken seriously….but after all, I was a child….so don’t judge me… just yet. We tend to judge ourselves by other people’s perspectives of us as children, because they are big and we are small. Therefore they know all the big stuff, and we only know some small stuff…..the kind of ‘small stuff’ that comes from ‘vivid and over-active imaginations’. Not much has changed for me; I still have invisible friends. I just know who they are now. I always felt ‘wise ones’—“Earthkeepers”–angels around me, and have memorable conversations with them. I feel their guidance and yes, even their playfulness. The world is changing at such a rapid rate, that the spiritual side of life is reaching out to us in so many ways to help us through these crucial times. They don’t interfere; they can’t. They never intrude; that is the purpose of our free will. They politely wait for us to request their intervention or for the answers we seek. “Ask and it is given”, you know…. For years, I talked to myself and answered myself….which really gets a bad rap, insinuating a little bit of crazy might be going on. However, the fact of the matter is that’s how we work through things. 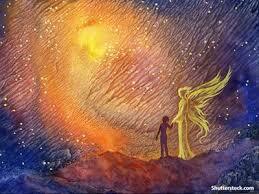 I regularly ask the angels to reveal themselves, and they never let me down. I often get a name. Anna. Throughout the years, I have learned through past life regressions that “Anna” is always either with me, or IS me…which is kind of freaky in itself, until you realize that we are all one with each other here in the physical, as well as the spiritual…..that while our physical beings walk the earth, part of our spirit walks with the angels, the saints, our guides, the ancestors, and all of the Masters who existed before us, and in every realm and dimension. Now, if you’ve read much of anything I’ve written, you know most of it explains the holistic lifestyle, numerology, quantum medicine, various metaphysical theories and practices, wedding scripts, and the many workshops FeatherTouch has to offer. I have covered a lot of area, rarely—if ever—relating to anything this personal, feeling very vulnerable in doing so….but as I’ve only recently learned, my vulnerability is my strength…Consequently, there was no question that I should put myself out there now. Well, ok….maybe a little bit of a question….like…. So I am. . I’ve put it out there just as requested, wondering the whole time if this might be some sort of test….in which case, I intended to pass, trusting completely in their motives. The interesting thing is that they have made it clear that their motives really have little to do with me. This is about all of us….all of you. So, if you have questions for the angels…for Anna….please make contact. With me. With them. It doesn’t matter. I would love to open that channel on your behalf, or help you to open it for yourself. Another interesting tidbit? I was told they would come through my writing in the beginning. And so they have….